I was not that fond of kale and initially only grew it in our garden to supplement our guinea pigs’ and bearded dragon’s diet. When it continued to grow throughout our harsh winters filled with snow and below freezing temperatures producing more than our pets could consume, I developed a new respect for its resilience and grudgingly added it to my diet. I used it primarily as a substitute for spinach and chard. It was not until I discovered that I could make chips with kale that I began to truly appreciate this healthy vegetable. Wash and dry the kale. Tear into ~ 2” x 2” pieces, avoiding the large ribs. Place kale pieces in a large bowl, drizzle oil over the kale and toss to ensure the pieces are coated. Sprinkle the spices over the kale, taking time to toss occasionally so the spices are evenly distributed. Place kale on a baking sheet in a single layer. Bake at 350 degrees F for 12 – 15 minutes or until the kale is crispy. 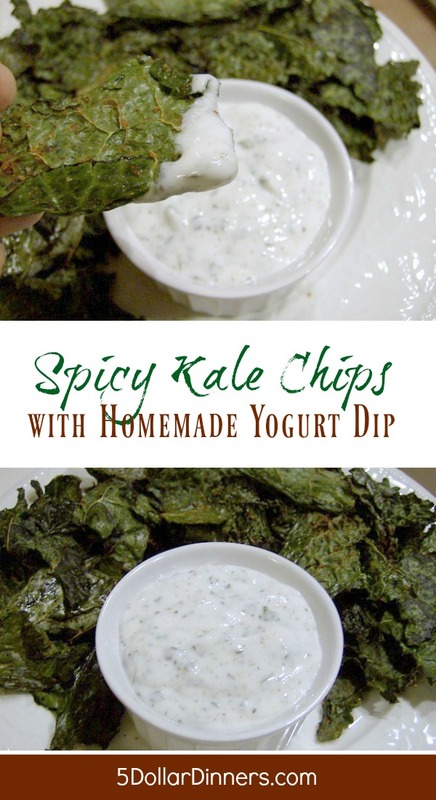 The spicy kale chips are a nice addition to salads in place of croutons or tortilla chips. My daughter says that she “refuses to think of these as healthy chips”. She prefers to think of them as “an unhealthy salad”. I hate to burst her bubble, but with only 1 tablespoon of olive oil for the entire bunch of kale, it is much healthier than most salads. I have decided not to explain this to her, instead I allow her her fantasy and tell her to live on the wild side and add some dip. In a small bowl, thoroughly combine the yogurt and spices. Refrigerate for an hour or two to allow the flavors to blend. Serve chilled. This yogurt dip also tastes great on baked potatoes in place of sour cream. Have you learned to enjoy a food that you initially disliked? sounds delish, I will try it for a party or a delish snack. 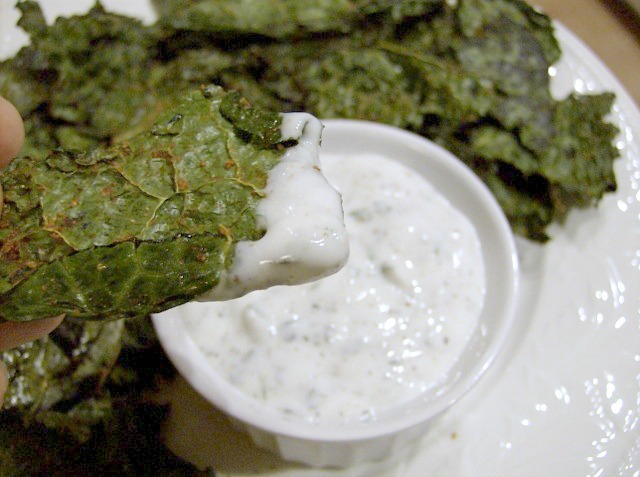 We absolutely love kale chips. Especially my youngest son. I need to try this… the only thing I ever use kale for is the Dutch stamppot which is basically kale and mashed potatoes. I have never heard of Dutch Stamppot before, but I would love to try it! The only problem I have with Kale Chips, is there are never enough =( The 2yo and I can go through a batch in one day (normally 2 large bunches before baking). I also like ours with a little bit of balsamic vinegar or Braggs ACV. Thanks for the idea! I have both balsalmic vinegar and Bragg’s on hand. I will have to give them a try with the next batch. We made kale chips for the first time last week and my 9-year-old LOVED them!